Casio first unveiled their new rugged Android Wear smartwatch back during the CES 2016 Technology Show which took place in January of this year. 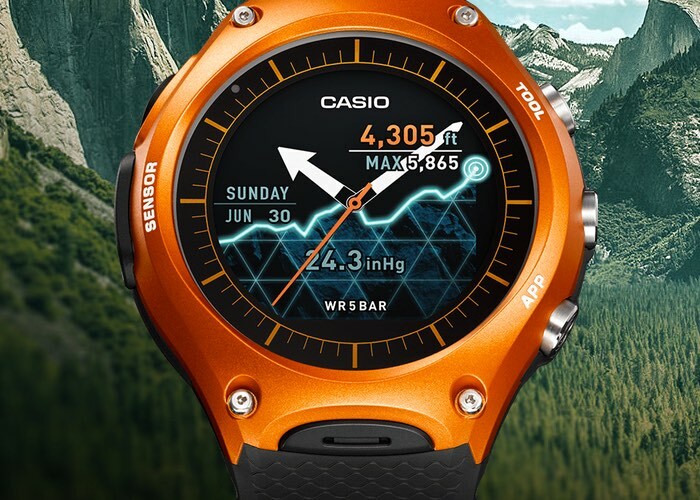 Now Casio has made available the new WSD-F10 from online retailers such as Amazon, REI, ShopCasio,Google Store and more priced at around $500. 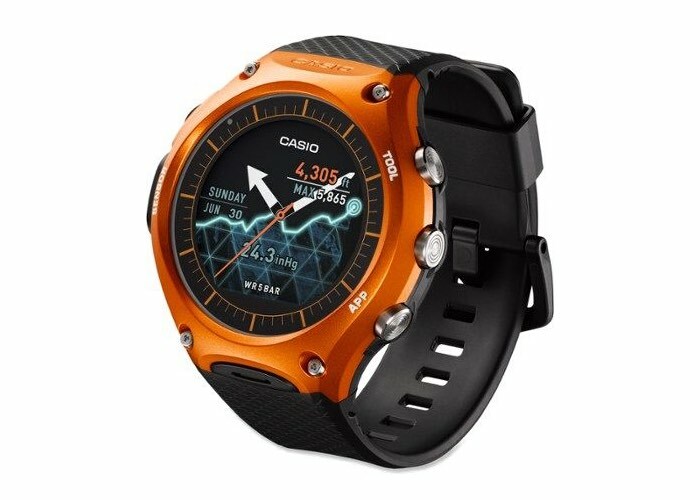 The new Casio Android Wear WSD-F10 smartwatch is available in a number of different finishes with a red version available exclusively from Amazon, while black and orange versions are available elsewhere. The Casio WSD-F10 smartwatch is compatible with Android versions 4.3 and even though it runs Android Wear is also supported by iOS devices from Apple’s iPhones 5 and above running iOS 8.2 or above although there is limited functionality with iOS devices as you would expect. The construction of the rugged smartwatch includes compliance with Military standard MIL-STD-810G and the watch is fitted with quad sensors provide real time notification of activity tracking, altimeter, barometer, and compass readings that can be accessed without the need for a smartphone or companion application. The smartwatch is also water resistant to 50 meters and suitable for short periods of swimming but not for snorkelling or diving unfortunately. Cassio explains a little more about their new rugged Android Wear smartwatch which is now available to purchase priced from $500. Incorporating both Casio’s tough performance and sensor technologies (Directional, Atmospheric, Accelerometer, and Gyro-meter) the WSD-F10 delivers a polished experience as a wearable information device. This smartwatch offers a wealth of useful, original Casio applications for outdoor activities such as trekking, cycling, and fishing. Among these are dedicated apps designed to measure changes in the natural environment and track activity levels. The device is powered by Android Wear, and users can also load compatible third party apps to expand the feature set for diverse outdoor activities. The WSD-F10 also offers the ultimate in ease of use as an everyday watch, making the most of Casio’s years of experience in the timepiece business. The wristband is made from soft urethane that conforms to the wrist and can be comfortably worn for extended periods. The watch face features a dual layer display with monochrome and color LCDs. Users can display measurement data and apps in color, or they can extend the device’s battery life to more than one month (est) by selecting the Timepiece Mode function that displays only the current time and date.